There are many wonders in life and things that can never be understood but probably the biggest miracle we’ll ever see would be when Princess Shyngle finally becomes a mother. The Gambian-Ghanaian actress with no midsection carrying a baby to term and safely delivering is going to be tagged as the 8th wonder of the world. And that might happen sooner than anyone thinks. 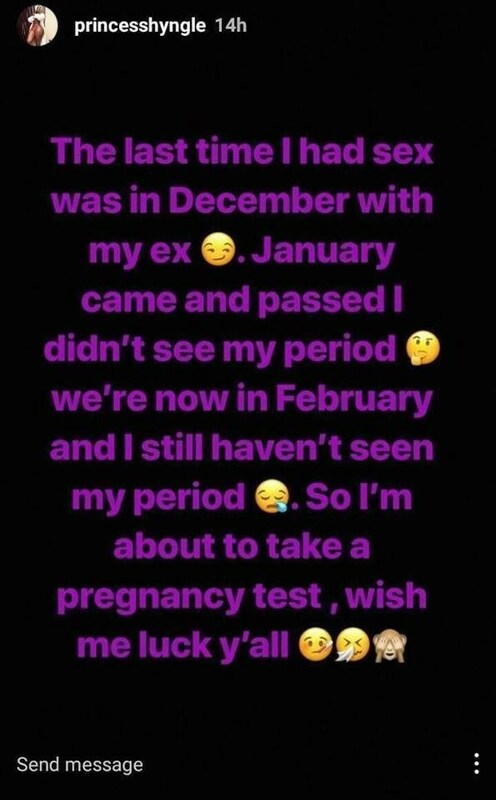 A recent post from Shyngle we’ve spotted online shows the actress has had a pregnancy scare. According to her, after last chopping herself in December she has missed her period and is now scared that she’s pregnant. Check out her post below..my only question is which womb is she going to house that baby? Na me hold am. Come collect am. IF YOU HAVE NOTHING IMPORTANT TO WRITE, BETTER USE YOUR FREE TIME TO DRINK COFFEE. SHE ONLY REVEALED TO HER FANS THAT MAYBE SHE IS PREGNANT BUT YOUR INSULTS ON HER WHERE UNNECESSARY. YOU HAVE A BAD MIND. Court Sacks Ebonyi Senator Ogbuoji For Defecting From PDP To APC, Asks Him To Refund Salaries. 17 Years Old Sent To Study Medicine In Russia Is Pregnant and Stuck! kaposky on: Court Sacks Ebonyi Senator Ogbuoji For Defecting From PDP To APC, Asks Him To Refund Salaries.